In the midst of winter our lack of exposure to sunlight has many biological effects including lowered levels of Vitamin D, serotonin and norepinephrine. The physical symptoms of these imbalances can lead to feelings of sadness, anxiety, fatigue, foggy thinking and disrupted sleep. There are natural remedies for these conditions. Often times these symptoms can be classified as Seasonal Affective Disorder (SAD) which affects up to 20% of the US population, primarily in the northern climates. If you can’t get away to a sunny location or the Greek Isles, we have effective clinical nutritional supplements to address these imbalances. Our recommendations include CeraVive, to address lower levels of serotonin and norephinephrine which are common in the winter, and Ultra-D Complex™ to address lower levels of vitamin D due to a lack of sunlight. 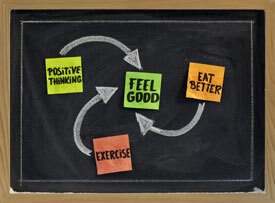 For more in-depth and personal analysis we can use customized functional nutrition. We offer testing to assess your neurotransmitter levels as well as evaluating your Vitamin D levels by reviewing your blood chemistry panels. Neurotransmitters are chemicals that relay signals between nerve cells. They are present throughout the body and all work together. They should be in balance for the body to feel it’s best and for proper brain and body function. Often these imbalances can have adverse effects on the adrenal glands as well. The stress handling glands can become fatigued and a low mental outlook is almost always a symptom of adrenal fatigue. The adrenal hormones are the vitality hormones which provide us with a sense of wellbeing and help maintain healthy mood and emotion. Treating adrenal fatigue is essential to feeling better. Natural remedies to treat the symptoms of SAD and feeling low are a good choice. There are virtually no side effects and positive results are often felt in as little as 2-3 weeks. Healthy diet choices and moderate cardiovascular exercise should also be included in any plan.